Did you put the pen down after the last post? And how is the cramp now – better? Good, because we’re going to press on with Horus the Elder. , khenty Khem, Foremost (of) Letopolis. 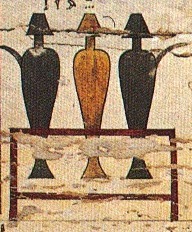 First and foremost, the word khenty comprises the three signs stacked one on top of the other on the left: The middle and lowest of them will be familiar to old Office Hieroglyphs hands, but the top one is new to this blog: , a row of water jars on a stand making the triliteral sound khent. (Ignore the diagonal line cutting across the top left hand corner of the sign in this example, it shouldn’t be there.) The wavy ripple of water beneath reinforces the n sound, and that perennial favourite, the loaf of bread, reinforces the t. The y sound is not spelled out here; it’s just understood. Khent = before or in front of, khenty = the on who is in front or foremost. It was obvious to the Egyptians from the context that khenty was what was meant here, and adding in the y would have spoiled the arrangement of the signs, so they left it out. 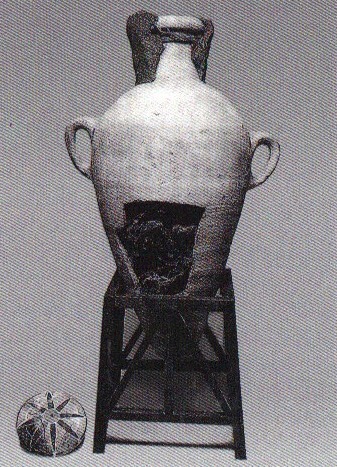 The artist has carried that shape over into the bottom of the jars as if they were shaped like that. And that’s the easiest way to draw them. I start by drawing each jar like a figure eight, with an elongated oval upper loop and a short, flattened triangle for the bottom one. The you just add a little T on the top of each jar for the stopper and a bent line each side from the shoulder of the jar to ground level to suggest the framework of the stand. I like drawing khent. It looks complicated but it’s easy once you know how. I think your hand deserves another rest now. We’ll get on to Letopolis next time round. Beautiful, isn’t he? He’s tricky to draw, but worth it. I usually start with a short horizontal line for his beak, curve up and over for his head, come inwards for his neck and then sweep outwards and downwards for his back, down to the tip of his tail. 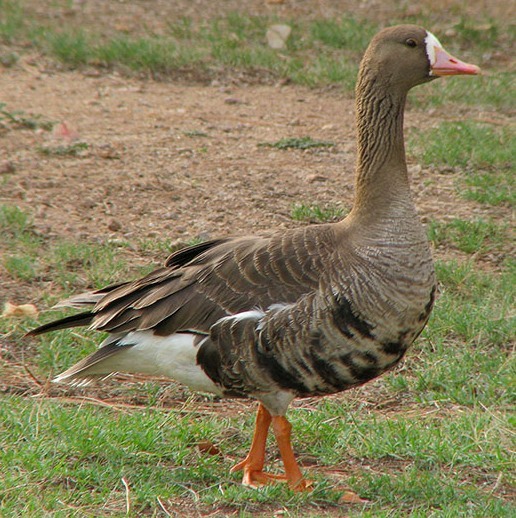 The you can return to the base of his beak, draw a flattish line for his chin and swoop in and out again for his neck and breast, pulling the line downwards for his belly and joining up the two lines at the tail tip. Make a deep curve across his body for the wing, and make the wing tip cut the line of his back. Then you can put in two short lines of his legs and a baseline for his feet. A final dot for his eye, and he’s done. The goose hieroglyph is a biliteral, gb. The foot hieroglyph which represents the letter b is another old Office Hieroglyphs friend, and is only there to reinforce the b sound already contained in the goose symbol. Finally, the seated god hieroglyph, familiar from many of our divine corporation nameplates, denotes that this is the name of a god. You’ll recognise the top half of Tefnut’s snake sandwich; the loaf of bread and the horned viper. On the face of things, this group should be pronounced tef, but in fact it’s the word ‘it, it, father. Other versions of the word have the inital ‘i written out in full, but ‘i is a semi-vowel (a vowel with some of the force of a consonant) and we know the Egyptians placed greater emphasis on writing down the consonants than on writing vowels, so they often left out the ‘i of ‘it. The viper in this case is not the letter f but a determinative – a soundless symbol put in to show what kind of word this is – whose significance is obscure. We’ve seen them all before: the temple flagpole representing the sound ntr, the seated god determinative; the loaf of bread for the letter t and the three short strokes denoting the plural ending w, the whole lot reading ntrw, netjeru, gods. Strictly speaking, the letter t shouldn’t be there. As we know, it’s a feminine ending, which might suggest that Geb is claiming only to be the father of the goddesses, which would not do him justice. We know he was not exactly a champion of female rights, so we can’t take this as evidence of positive discrimination in the workplace. I think it’s probably crept in there because the similar title God’s Father, found in the titles of certain high-ranking Egyptian nobles and possibly meaning King’s Father-in Law, was often written with the flagpole sign followed by the loaf of bread from ‘it, father, and the scribe just kept on going because he was so used to writing that title, even though he’d already written the word for father. But enough of these bureaucratic technicalities. Geb was the third patriarch in the family firm. Why did he claim to be the father of the gods? What was so special about his divine kids? Well, let’s meet the gods’ mother, first, and after that we’ll find out. As you can see, her name – if you forget about the unspoken determinative at the end for a minute – begins and ends with our old favourite the loaf of bread letter t, which I suppose makes it a sandwich. And what’s the filling? The horned viper letter f and the water pot nw, both of which we’ve had before. Not everyone’s choice of a packed lunch, perhaps, although snake is supposed to taste like chicken. 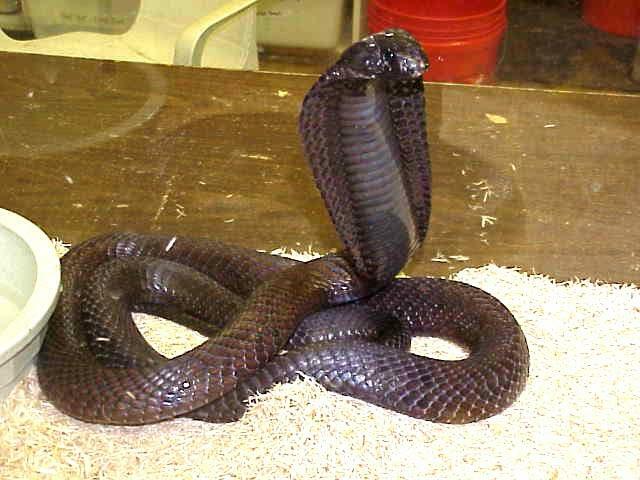 This one is a (non-horned) cobra, and was often used as a determinative for the name of a goddess, especially if the goddess in question were a snake goddess like Wadjet, the cobra goddess who adorned the King’s forehead. But other goddesses could use it as well. Tefnut was a lioness rather than a cobra, but her Dad Atum was the original giant serpent, so I suppose she felt entitled. And she ate those little horned vipers for lunch. The cobra determinative is tricky to draw, but it can be done. You may want to start with a little flat head, like a sock puppet looking straight ahead. Then you can make the wide sweep of the hood, tapering down to the narrow body; turn and continue horizontally, then make a downturn for the tail. The you can add a loop in each “elbow” to suggest the coils. You’d need a whole row of baguettes to make a sandwich out of that. Bendy or not, it gives the sun disk somewhere to hang. The sky had a particular significance for Tefnut, as we’ll find out when we meet her and Shu’s children. In the meantime, just remember: however heavenly the chairman’s daughter, if she invites you to lunch, take your own sandwiches. The ‘I or A at the beginning is in brackets because in this spelling it’s not actually written in the ancient Egyptian, although it did sometimes appear. (In some versions, he has an -w sound at the end of his name: ‘Itmw.) That won’t surprise you old Office Hieroglyphs hands, because you know the Egyptians hardly ever write the vowels; what we mostly have are the consonants. But the name derives from the word tm which meant “complete” or “whole”; as the creator god, Atum contained within himself everything out of which he created the world. Well done. Got it in one, didn’t you? It’s a sledge. Right. Just what you need in the frozen wastelands of the Nile Valley. And why not? As I write this, Cool Runnings is on BBC Three, and Ghana is sending a skier to the winter Olympics. I bet if they’d had sledging in the ancient Greek Olympics, the Egyptians would have swept the medals table clean. The Egyptians used sledges a lot. They didn’t have snow (although some of them did encounter it on their travels in the Asiatic lands) but they had lots of wheel-clogging sand, heavy loads to transport, and wooden axles which couldn’t take the strain of chunky basalt statues or massive blocks of limestone, let alone the odd granite obelisk. Sledges were ideal for transporting heavy weights across the sand, including statues of gods. This picture shows a gang of hauliers dragging along a the seated statue of a tomb owner lashed to a sledge. (The statue, not the tomb owner, that is. The statute is shown at a much larger scale than the men hauling it, because it’s much more important than they are – it’s a representation of the tomb owner, very expensive and very difficult to replace, unlike the workers….) That explains the cross-lines and the loop at the front of the hieroglyph; indications of the ropes which were used to haul the sledge. What is it? Nobody knows for sure, but it’s easy to draw; start with the top line, do a blunt, rounded downturn at one end and leave the other end open. It was pronounced ‘im and it’s reinforcing the m in the biliteral sign tm. There, that didn’t take long, did it? Ignorance is much easier than knowledge. It’s a seated god. We know he’s a god because he’s got long hair and a beard, and he’s modestly swathed in an all-enveloping robe, unlike the short-kilted, bare-armed seated man we met at the end of Office Hieroglyphs. The way I draw him is to start at the top of his head and make a long stroke halfway down his back, then do a little dog leg inwards to indicate the end of his hair. Then bring the line down his back and bottom, continue with a straight line across the base, a sharp turn and little slope up for his feet, then a swoop out, up and over for his knees, straight up for his chest, a little wiggle to indicate his face and stick the beard on last. I don’t need to tell you, because you know from Office Hieroglyphs, that determinatives were not pronounced; they’re only there because the Egyptians didn’t write the vowels, and they needed extra visual clues to tell them which kind of word the consonants were meant to convey. then they knew which vowels to supply themselves when they read it. So now you can adapt the offering formula so that your colleague’s gifts come from the god Atum instead of Osiris. Wow – you’ve doubled your god quota almost overnight! But Atum without his titles is not much of a substitute for the Lord of Busiris, the Great God, Lord of Abydos. If you’re going to slot Atum into the offering formula instead of Osiris, you need to slot in his full complement, Lord of the Two Lands, Lord of Heliopolis, the Great God, Lord of the Sacred Land, behind him. Otherwise he just looks naked. And you can tell from the all-encompassing robe that he wouldn’t have liked that. Well, would your chairman? And, be honest, who really wants to see the chairman naked? You know how you sometimes get a Christmas card, but can’t for the life of you make out the signature, and spend the whole New Year wrestling with the guilty suspicion that you’ve missed someone off your list, while they kept you on theirs? Well, this is not going to happen this time; not on Office Hieroglyphs, it isn’t. We are about to decipher the cryptic symbols by means of which our revered tomb owner conveyed his name – or at least had someone else to convey it for him. Senusret, sometimes transcribed as Senwosret or, in its later, Greek form, Sesostris; a name of commoners, nobles and of course a number of famous Twelfth Dynasty Kings. If you cast your mind back to the very beginning of this blog, you may remember that we encountered the device known as honorific transposition, which is a pretty rotten trick to pull on the eager beginner. However, we’ve seen it before and we’re not intimidated. We know it just means that the Egyptians believed that some words were more important and magical than others, especially when they were written down, and that they had better write down the most powerful symbols in a word or phrase first, even if they were not actually spoken first, or the magic letters might get annoyed and start acting up. Well, Senusret is one of those cases. It is a theophorous name, which means it contains the name of a god or, in this case, goddess: the goddess Usret or Wosret. 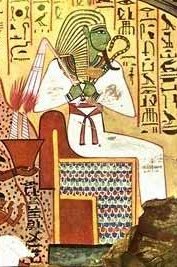 Senusret means “Man of (the goddess) Usret”. 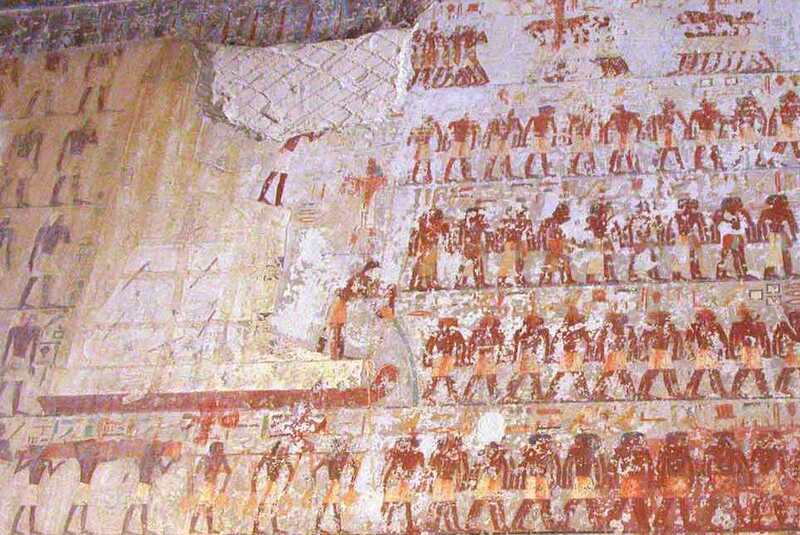 And you’ve guessed it; even though the tomb owner’s name was Senusret, the diva gets her name at the top of the bill. This is why, in very old textbooks written before they’d figured it out, early Egyptologists sometimes wrote the name as Usertsen. Usret: literally, “the powerful one”, perhaps an early version of “She-Who-must-be-obeyed”. She was a relatively obscure goddess who is rarely depicted, probably because her cult flourished (at Thebes, modern Luxor) during the Middle Kingdom in Egypt (roughly 2000-1700 BC), and very little remains of the temples of that period – they’ve mostly been broken up, re-used and covered over by later monuments. Similarly, later, even more powerful goddesses supplanted her as objects of worship. However, the Kings of the time, who came from her home town, saw her as their patron goddess, which was why several of them were named after her. Maybe they need something to mop up the blood at this point in the formula. Two curves touching at the tips will describe it nicely. representing the letter t, and forming the feminine ending, so we know Usret is a goddess, not a god: “the powerful (female) one”. Look at them all, like presents in Santa’s sack. We’ll pull out the last couple next time. Wabet, “pure” or “clean” – in the feminine form when spoken, but without the loaf of bread representing the t , because it’s so obvious to those in the know that the scribe, dashing off yet another offering formula, hasn’t bothered to write it down. But we know it’s there, don’t we? Advanced office scribes like us will also have deduced that the masculine form is wab, and that the rather curious sumbol above is a triliteral sign conveying the sound of three letters, w a and b.
We’ve had b before, haven’t we? If you cast your mind back to the first line of the offering formula, when we were looking at Abydos or Abdju, one of the major cult centres of Osiris, you’ll recall that the letter b in ancient Egyptian is represented by the human foot. And what do we have as the bottom half of this symbol? A human foot! That’ll be the b, then. But what’s that spout on top, and what’s it spouting? No, it’s not what you’re thinking. They could draw what you’re thinking much better than that. The upper part of the symbol is a little water pot, and it’s pouring forth a libation of purifying water. It’s a shame the painting has flaked away just where I want to show you the water spouting out of the pots, but never mind. And the blue wiggly lines for the water have come out nicely. So, the symbol for “pure” was the standard ritual purification device of ancient Egyptian religion, the pot pouring out clean water, rendering the person or object it was poured over cleansed and pure. 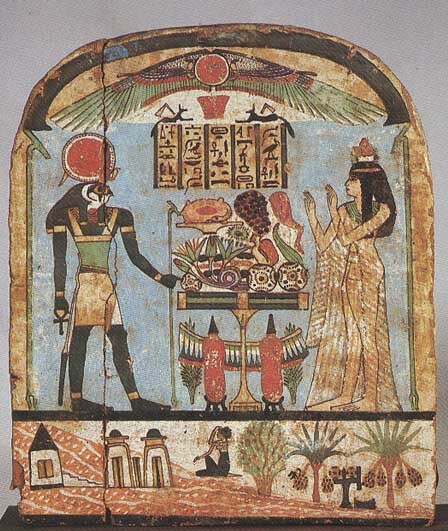 Wab was also the word for “priest” in ancient Egyptian; literally, “the pure one”. We already know how to draw the foot. Then just draw a little oval on top for the pot, like an egg lying on its side, but square off the pointy end a bit for the rim. Then draw a zigzag line for the water, arcing out of the pot in a graceful curve. Finally -please remember all this when the office plant contractors come round and water the aspidistras. And stop stubbing out illicit cigarettes in the rubber plants, and using the weeping fig as a receptacle for your coffee dregs, or the office party plonk. They’ve been ritually purified. Have some respect. Nefertari, “the most beautiful of them all”. Nope? Give up? OK, I’ll tell you. It’s the heart and windpipe, possibly of an ox. Aaaah, of course! You’re smacking yourself on the forehead now, aren’t you? What else would you use to convey the sound for good or beautiful? Well, I suppose these abstract concepts are hard to draw. You have to reach for the practical, and the practical can be pretty earthy. I suppose that, as writing was invented to keep inventories of valuable commodities, the butchered components of an expensive animal like an ox would be something you would want to itemise on a list. The sound is just a coincidence. When writing is developing beyond the practical to capture abstract qualities, if a symbol already exists for that sound, that’s what you use. So, they used the heart and windpipe for nefer, meaning good or beautiful. However, in the case of our offering formula, like nebet in the previous post, the adjective is feminine, to agree with khet, “thing”. You could put a loaf of bread after it, to stand for the “t” if you wanted, but as it’s a formula and things tend ot get compressed in formulae, the scribe hasn’t bothered in this example. To draw the nefer sign, I usually start with the downward stroke, loop it around to make a squat little jar shape for it to stand on, cross the upright like a Roman t (I usually cross it twice, as the Egyptians often did, too) and then put in the details on the jar shape: a little crescent above, and a little loop below. You can see the internal markings of the heart carved into the limestone, but not into the tiny bit of gemstone – too fiddly, perhaps, when you have a lot of them to do. Again, I did consider putting a picture of a real, gory specimen on the blog – but if you really want to see one, you know where to look. I’m not squeamish, but I don’t want to put people off. So, if you fancy one of your colleagues but don’t know how to tell them, you can write the hieroglyph for beautiful on their whiteboard, and take it from there. Or, if you really loathe them but are forced to write the offering formula on their birthday card because you’ve done it for yourself, you can console yourself that what you’re drawing for them is something really gory. Fill in those details with relish! Khet nebet. Every thing. Or, rather, thing every. Let’s look at thing, first. Khet, thing. As you’ve been sitting there, starving, for two and a half months, your attention will have been fixed instantly on the loaf of bread which, as usual, represents the letter t. I wonder whether you’d fancy eating the object depicted above it, the symbol which to the Egyptians represented the second of their collection of four letters h? Some people have been known to eat it. The identification is not aboslutely certain, but it’s quite possible that it’s the symbol for a human placenta. Some of you may be making the very sound of the second letter h as you contemplate the idea of eating it, especially if what you are eating at the moment is attempting to reguritate itself and / or fly across the room. Some of you may be made of tougher stuff. They don’t help much with the identification, do they? And they don’t look very appetizing. I don’t know whether the Egyptians ate their placentas or not, but I did find a shampoo which listed placenta as an ingredient in Canada, of all places. Who’d have thought it? Anyway, in this context, it’s not for eating, it’s for saying the second letter h. Kh. And it’s easy to draw: just a circle and some cross-hatching. Nebet means every or all. The signs need no introduction to you. We had the basket sign, neb, before, as the word for “Lord” in the titulary of Osiris. Neb aslo means “every” or “all”, and it appears here as nebet because it is in its feminine form, agreeing with khet. The “t” endings of words are often feminine. There. For two and a half months you’ve been feeling abandoned. Now you’re the tomb owner who has everything. In other versions of the peret-kheru group, the rather more elaborate loaf is replaced by the simple bun shape of t, te, which demonstrates that this is is the simple word for bread. You can use either version. They’re both easy to draw. Almost as easy is the last sign in the group; henqet, beer. When you’re invoking a farewell pint or ten for Donald in Sports Equipment, all you’ll need to do is draw a jar shape with a t-shape on top;- make the crossbar wide and the stem very short, and you’re there. But it was very nutritious. Bread and beer were the two staples of the Egyptian diet, both made from grain, and both taught to the Egyptians by Osiris, god of the harvest. They were the first things the tomb owner put on his shopping list for the afterlife, and the first thing to appear on his menu. An invocation offering of bread and beer; not much different from the first things the waiter brings to the table in the restaurant, in fact. We’ll move on to the main course next time. Di ef; so that he may give. (Don’t worry about the so that bit, it’s contained in the verb. We’re not doing grammar, remember?) When you’re drawing it, give the upper arm a bit of thickness, a single line will do for the forearm, and a little curve for the hand. Then draw a triangle in the palm for the loaf. Easy. ef; he. The dot just attaches the pronoun to the verb; it doesn’t have anything to do with the pronunciation of ef. All you have to do when you draw a horned viper sign is start at the head, bring the stroke down his neck, give his back a wiggle and finish him off with a little tail, then do a v-shape on his head for the horns. Isn’t he lovely? And even though he’s yellow, ecologically speaking he’s green.